ST.CROIX- An unfamiliar face walked into the theater on a Wednesday afternoon. He walked to the back to the only piano, a Baldwin, sat down and played an original song, “Origami,” while students listened in amazement. The University of the Virgin Islands has musically talented students who might be compared to famous pianists such as Ray Charles, Ludwig van Beethoven and Sun Ra, but they go unnoticed. Students at UVI say there isn’t a strong music program and going off island seems to be the better option. Jahmal Francis emerges from the circle of students whose musical talent stands out. Francis is an 18-year-old freshman at UVI. His personality and calm charisma is sculpted by music. He started playing the piano at the age of 12 and at 15 he made a special effort to master his talents. Francis sings and has mastered both the tenor saxophone and the piano, with piano being his favorite. His high school music teacher taught him the basics of playing the piano, however, he learned the rest on his own. He enjoys incorporating his R&B style into every key he plays on the piano. “I first play with my heart, then my hands in a sense. The music takes me away,’” he said. This multitalented student majors in business management but his true passion is music. Francis Francis says he might transfer to a different school. He really wants to major in entrepreneurship with a concentration of music, however, majoring in music is not UVI’s strong point. According to UVI’s website, the only degree program that UVI offers in relation to music is a bachelor’s degree in music education. Francis is torn between leaving home and going away to study his true passion. When Francis is not playing a mellow tune, he is writing poetry. 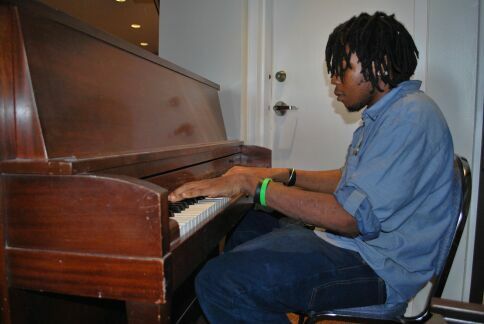 In his free time he plays his emotions into his piano and projects his lyrical thoughts on paper through song writing. Francis is a perfectionist when it comes to his music. Along with recording his music, his keen hearing for piano notes allows him to tune his music to perfection. Francis is an original. His smooth style, soulful keys and other musical elements included in his music are 100 percent him. He listens to a variety of music because he believes every artist is unique and it inspires him to be different. Listening to a variety of musical genres allows Francis to channel his musical abilities through his voice and instruments to share with other people who enjoy music. There are only a few people who aware of Francis’ talent because there are limited showcasing outlets for musical talent at UVI. Promoting himself as an artist can be difficult because he does not have the proper materials to record his music. However, Francis still finds alternatives to promote his music through social networks like Facebook. Francis and a group of other young artists are on their way to making an album. The album will contain a collage of young local artists showcasing their different styles and abilities. Music is something special to Francis. It brings out a humble, artistic aura that touches others when he plays. Even though showcasing outlets and required materials to record his music are few, Francis pushes through and finds alternatives to stay local through the album and remain at UVI. The University of the Virgin Islands has musically talented students who anxiously wait to find an outlet to showcase their abilities. “If you have a talent, use it in every which way possible. Don`t hoard it. Don`t dole it out like a miser. Spend it lavishly like a millionaire intent on going broke.” said Aaron Kildow. Previous PostUVI Little Theatre to Stage ‘Bus Stop: with Caribbean Seasoning’Next PostCollege life got you down?